Remember this? 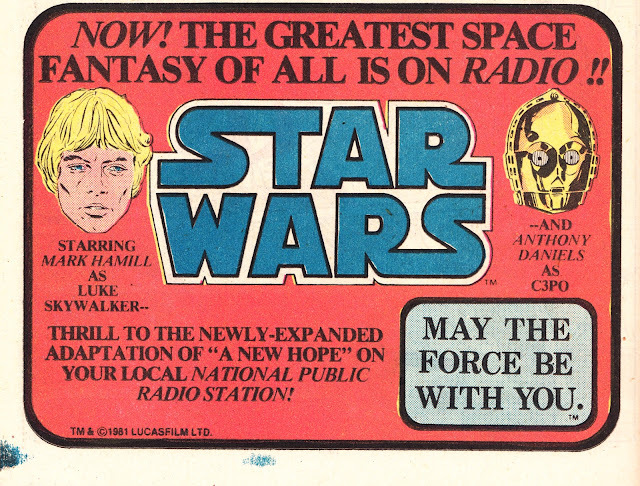 The STAR WARS RADIO ADAPTATION. This is a US advert (from Marvel Comics dated July 1981) for the broadcast on NPR (National Public Radio). The thirteen episode series, which reunited some of the original cast, reached British Star Warriors via BBC Radio One. I remember being on holiday somewhere in the UK (where, unfortunately, is lost to the mists of time) and insisting that we listen in the car every afternoon to the latest episode. I'm not sure whether that was the original British broadcast or a repeat. The short episodes (the whole adventure runs to almost 6 hours) aired as part of the station's afternoon schedule. It's telling that I remember this but nothing about the DJ or the programme that surrounded it.